Some recipes are born from a love of making some of my recipes easier. I love to whip up a good quiche or frittata but sometimes I like to keep things simple (really simple). This baked egg dish is about as easy as it gets, once you get quick at dicing. 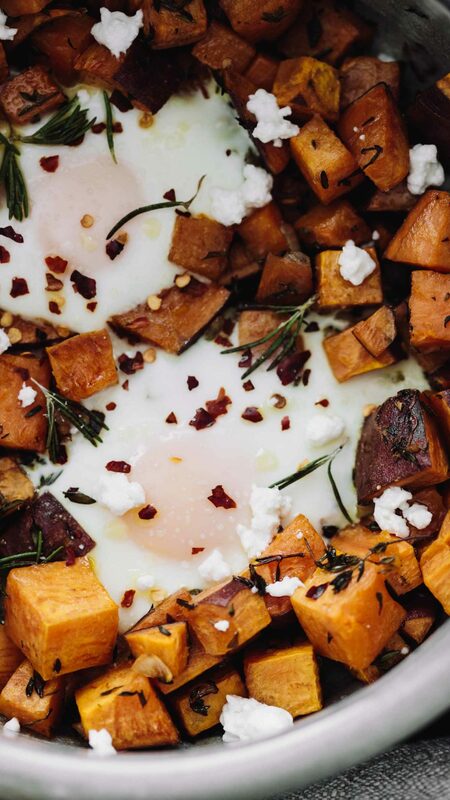 Don't throw this recipe out if you don't like sweet potatoes. It's really the concept of baked eggs that I would recommend. Any vegetable that goes well with baked eggs, and can be roasted, is a possibility here. There are a few items that you can tell I love, just by the amount I use them in recipes. Shallots are at the top of the list. Sure, they are can be more of a pain to prep but the flavor gets me every time. It's the perfect mix of sweet and savory, all with a small hint of garlic. Of course, you can go with something a bit more forward. Try a bit of minced garlic added in with the sweet potatoes. During the spring months, green garlic can also add a nice flavor (and a bit of color contrast!) Or, go with the solid stand-by of minced yellow onion.